Discovering colour in nature is exciting from a materials point of view. Nature is immersed in colour and its role informs the materials world and designers. In human civilization, the earliest cave-dwellers used pigments in their rock drawings. Before paints were chemically produced, earth colours were the most dominant (yellow, brown, and red ochres). Pigments and dyes (colouring substances in solution) were made from minerals, animals and plants. Later on in history colours such as purple were rare and expensive. The purple colour was produced from an extremely expensive dye called ‘Tyrian’ which was made by crushing thousands of sea shells. It did not fade from weathering and sunlight but instead became brighter and more intense. However, in today’s age synthetic dyes and pigments that meet various purple colour requirements have removed the mystique of the colour. Animals produce colour in different ways. Pigments are particles of coloured materials. Chromatophores are cells containing pigment, which can change their size to make their colour more or less visible. Some animals, including many butterflies and birds, have microscopic structures in scales, bristles or feathers which give them brilliant iridescent colours which flash emerald green when they catch the light. Examples can be photochromic materials, which change colour in response to sunlight. Here Rainbow Winters Petal Dress (Printed with photochromic ink). 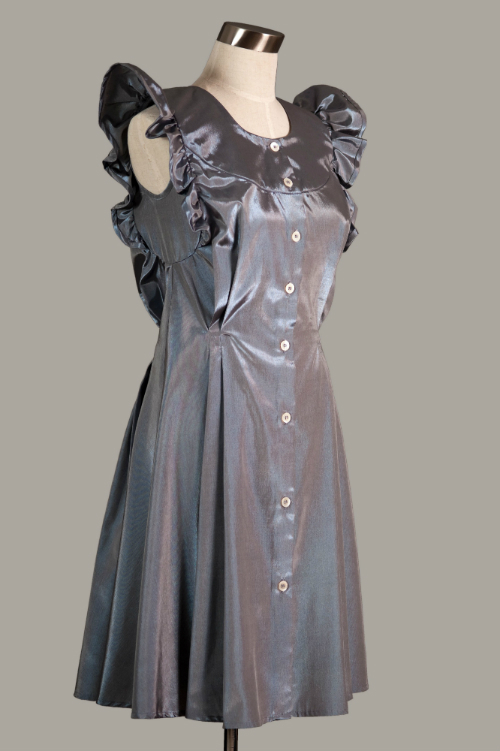 Inspired by the colour transformations of the rainforest, the dress changes, under UV light to purple on the outside. Rainbow Winters petal dress indoors, left picture. Right picture, outside where the colour changes to purple. Image: Cereinyn Ord. Classical dyes and pigments produce colour by the absorption and reflection of light. Whilst organic dyes are mainly used to colour textile fibres, pigments are used in inks, paints and plastics. Examples can be ‘electro-luminescence’. The absorption of energy followed by the emission of light. Absorption of light and energy transfer (or conversion) involves coloured molecules that can transfer electromagnetic energy. The absorption of natural sunlight by chromospheres (literally, ‘sphere of colour’) is exploited in solar cells for the production of electrical energy by dye-sensitized solar cells. Professor Michael Grätzel’s (École Polytechnique Fédérale de Lausanne) dye-sensitized solar cells are inspired by the photosynthetic process and consist of a porous layer of titanium dioxide nanoparticles covered with a sunlight-absorbing molecular dye. Earlier on we discussed how some animals have brilliant iridescent colours. 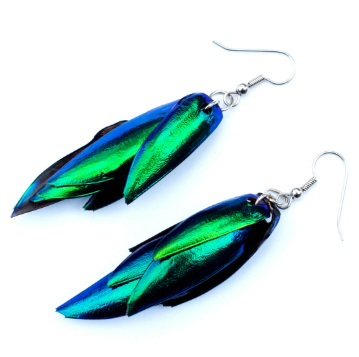 ‘Beetle-wing’ earrings. Traditionally made in Thailand their wings were valued for their beautiful and hardy metallic emerald iridescence. The shiny appearance of beetle wings is long lasting. Available at Pebble London. The dragonfly, the lavender beetle, the chalk blue butterfly, the shoal fish and peacock feathers. We become mesmerised when we see something in nature with a multitude of colours, or when the colours seem to change depending on our viewing point. We are immediately drawn to their iridescence (from the Latin word, “iris,” meaning rainbow). Journal of the Royal Society Interface is the UK Royal Society’s cross-disciplinary publication promoting research at the interface between the physical and life sciences. 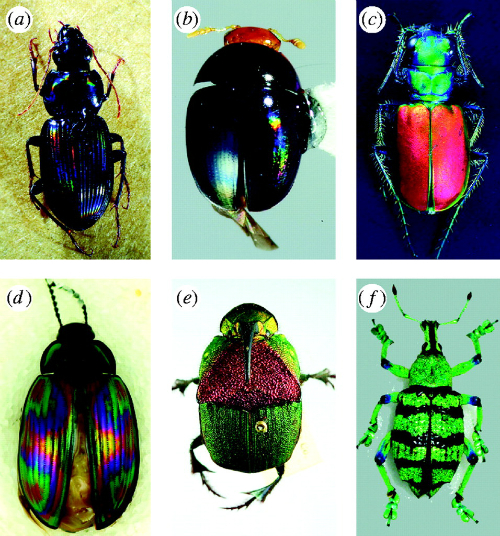 Below they give some examples of beetle iridescence. (a) Loxandrus rectus (Carabidae: Harpalinae), (b) Phalacridae gen. sp., (c) Cicindela scutellaris scutellaris (Carabidae: Cicindelinae), (d) Amarygminae gen. sp. (Tenebrionidae), (e) Phanaeus vindex (Scarabaeidae: Phanainae), (f) Eupholus sp. (Curculionidae: Entiminae). Morpho butterflies flash to be noticed. 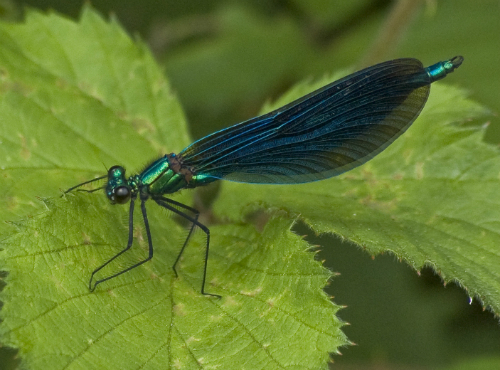 Their metallic blue wings have a mirror-like surface made up of tiny scales that reflect light more effectively than any known natural pigment. They coast through the dappled light of the rainforest in zigzagging flight patterns, flashing iridescent signals that can be seen over great distances. 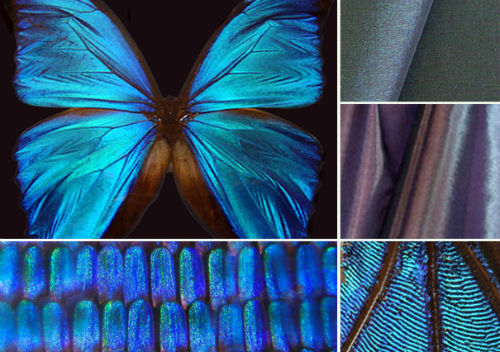 Morphotex fibre mimics the properties of the Morpho butterfly with the iridescent colour of its wings, also similar to that of a peacock feather. The Japanese textile company Teijin has reproduced this microscopic structure using polyester and nylon fibres in alternating layers so that light will bounce and scatter between the layers to reveal a rainbow of colours. As the colour is purely a trick of the light, no dye is needed which cuts water usage, toxic chemicals and energy used to dye the fabric. The fabric will also never fade like dyed fabrics often do. Sydney designer Donna Sgro fashioned the frock from Morphotex, a nanotechnology-based, structurally colored fiber that mimics the microscopic structure of the Morpho wings. Materials may be used to manipulate light via a variety of mechanisms. For instance, a change of orientation of molecules as in liquid crystal displays or by purely optical means such as photonics. Photonic crystals are also present in opals, butterfly wings, certain species of beetle, and peacock feathers, which all feature arrays of tiny holes, neatly arranged into patterns. This intensely pure colour coined ‘structural colour’ has driven researchers to explore the possibility of replicating this effect in research collaboration between the University of Cambridge and the LBF Fraunhofer Institute, Darmstadt. 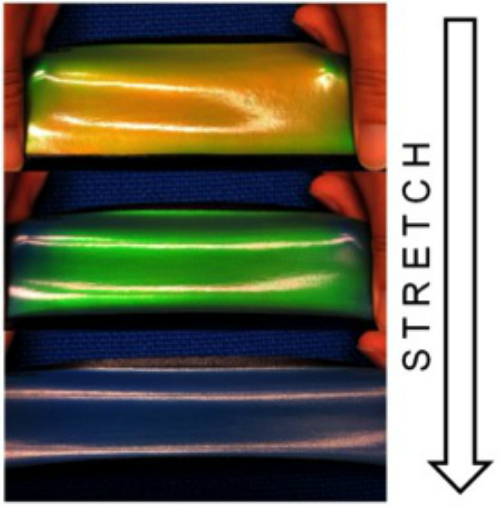 Polymeric materials have been developed that achieve this goal through a scalable manufacturing process. Structural colour fabrics are a magical alternative to painted or dyed materials. The colours are more intense, do not fade over time and look metallic, although the material contains no metal. Polymer opals are non-toxic, unlike a lot of dyes, and change colour with stretch. Gemstone opals achieve their characteristic brilliant colours through countless sub-micron spheres neatly arranged into crystal structures. In the same way, polymer spheres can be synthesised and arranged into crystal structures to produce similar iridescent colours. Whilst synthetic opals have been fabricated in the lab for over two decades, the samples are brittle and are not suited for mass-market applications. This unique property suggests further applications where inexpensive indication of tension of flexing is required. The material can also be fused into fabrics to produce dynamic colour in garments. 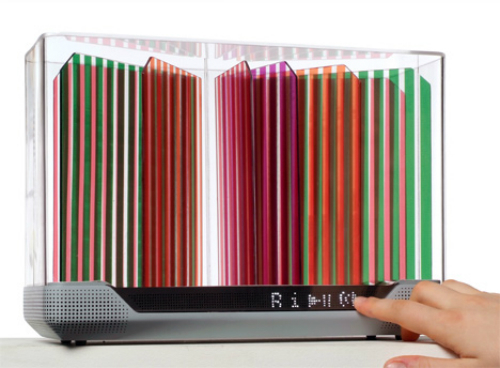 The whole process from scientific laboratory research, scaleable commercial manufacturing and design translation is the perfect example of colour as a source of inspiration for real world application. Polymer opal can be manipulated through a variety of design processes. 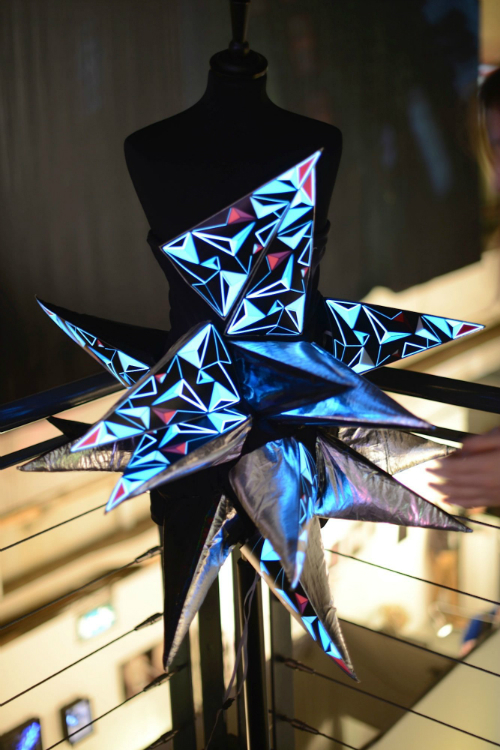 Examples could be laser-cutting, layering colours, and heat-transfers creating a new design tool for fabric. The aesthetics and visual response of these low cost materials make them ideally suited to novel fabrics, high impact and functional packaging, brand protection and anti-counterfeiting, optically responsive smart materials and strain mapping. If you want to know the next step in the evolution of colour in materials, then look to nature for the answer. Then look to scientific research and design for the tools to make it happen. Maybe you will be part of the answer. This entry was posted in Material Innovation and tagged biomimicry, butterfly wings, Cambridge University, Cholesteric liquid crystals, Chromic Phenomena, colour change, Iridescence, light, Metallic surfaces, morphotex, Nano-structures, Nanomaterials, nanotechnology, nature, Non-metallic materials, photonic crystals, pigment, Polymer Opal, rainbow, Smart materials, Structural colour. Bookmark the permalink.